We are nearly at the one-third mark of the 2019 AFLW season (seriously – extend the season next year, AFLHQ), and already some extremely surprising and unsurprising trends have emerged so far. Let’s start with the unsurprising. Last week HPN told you that the first round of every AFLW season to date was the lowest scoring of that given season, and that it would almost certainly increase over the course of the rest of the season. Last week, scoring increased from 320 total points in round 1 (32 per team, or 64 per match) to 364 total points (36.4 per team, or 72.8 per match). That’s a leap of about 14%, and made this the fourth-highest scoring round of the AFLW since the league’s inception. This is also not shocking in the slightest. Expect scoring to continue to rise, because over the last two seasons the biggest scoring rounds were late in the season. Across the 10 games played so far, the higher ranked side from our pre-season chart has won nine. The one upset to date was produced by Brisbane’s nail-biting victory over GWS in round 1. While there have been close games to date, there haven’t been any real shocks beyond what talent levels could have predicted before the season. However, the season is quite young (while simultaneously entering the final five weeks before finals). If one of the lower ranked sides wants to make a charge to finals, they had better do it soon. What a surprise! The idea of introducing conferences rather than slightly extending the length of the season was misguided at best, and condescending to the talents of these top level athletes at worst. However the execution of the idea was perhaps even worse – with Conference A dominating Conference B to date. This will normalise a little as the season progresses, as the stronger Conference B squads face weaker opposite conference competition, but right now A is undefeated against B. According to an extremely early version of the HPN Team Strength Ratings, the top five sides all sit on the A side, whereas all the struggles operate in Conference B. 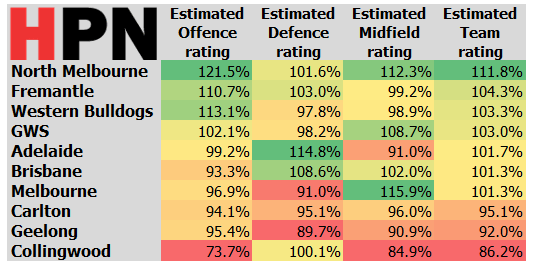 A quick note – HPN normally applies an opposition strength weighting, and sides like GWS who have played North Melbourne and Brisbane will suffer from a difficult early schedule. However, it’s still too early to make such adjustments after two rounds given the math involved. HPN will try to start incorporating this balance measure next week. This imbalance, caused by North Melbourne’s recruiting, Collingwood’s player losses, and other such factors, was obvious to almost all observers before the season commenced. Yet nothing was done to fix it, with a crude and simple split implemented, blind to personnel change. Next year the AFL can’t afford to make a similar mistake. First, some context. As HPN was putting together the outline for this piece, one stat quickly came to attention. Collingwood has had 78 handballs. For the season. Four sides average more per game than Collingwood has achieved over both. But, it is worth noting, Collingwood has struggled to get the ball at all this year. The Dogs, sitting pretty at 2-0, have had less trouble. But they are almost as handball-adverse at the cellar dweller Magpies. The Bulldogs have handballed the ball twice more (80 vs 78) than the Pies, but if you look at the proportion of handballs to kicks, the Dogs stand alone. 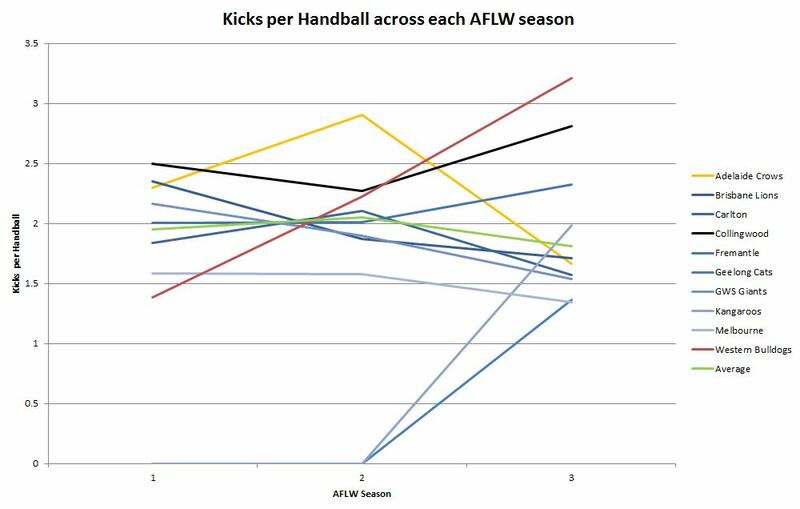 The average number of kicks to handballs across the competition has actually fallen a little this year, but the Dogs seem to have made the decision to throw the ball on the boot wherever humanly possible. In the first season they were the most handball-heavy unit going, before shifting to just above league average last year. This year, they have obliterated the previous high water mark of Adelaide last year. Simply, this harks back to the old days of footy, where territory is critical to win games, and who are we to criticise? The gradual shift has worked so far, but if they continue on this heavy path, sides might start throwing numbers behind the ball to cut out the inevitable bailout kick. Again, two weeks is a small sample size, but Adelaide’s past success was never driven by accumulating a large number of marks. In the first two AFLW seasons, the Crows sat third from the bottom for marks per game. This year, Adelaide has rocketed to equal second, behind only North Melbourne. Part of this may be down to the coaching change made during the offseason, and part may come down to the poor weather conditions other sides have faced. Adelaide have probably mildly exceeded the expectations placed upon them before the season started, and the slightly different approach may have something to do with this. Finally, another item that is probably affected by a small sample size and poor weather conditions. So far the league-wide accuracy for goal kicking across the competition sits at just 45.45% – down from 48.7% last year and 53.3% in year one. Other than the poor early season conditions that most sides have had to face, it might have to do with the types of opportunities presented to sides so far – with a lot of opportunities on the run, and set shots being well defended by oppositions. Expect this to bounce back up by season’s end.